The following table provides information and tips for entering advanced Exchange settings. Settings include options for changing port numbers, using SSL, downloading message headers, and setting server addresses. To access these settings, click Outlook > Preferences > Accounts, select the Exchange account, and then click Advanced. If Outlook cannot automatically detect your Exchange server, you can enter its address here. To be able to edit the port number that follows the server address, select this check box. Secure Sockets Layer (SSL) is an encryption technology that helps improve the security of the account. If you have a slow network connection, you can use this option to improve performance. Only message headers are automatically downloaded to your computer. Therefore, large messages (and any attachments) are downloaded only if you select them in the message list. However, when you are offline, you can't read the message bodies or attachments. Also known as an LDAP server. Enter the name of the server that is provided by your system administrator. This server address is commonly the same address as your Microsoft Exchange Server address, but this is not always true. 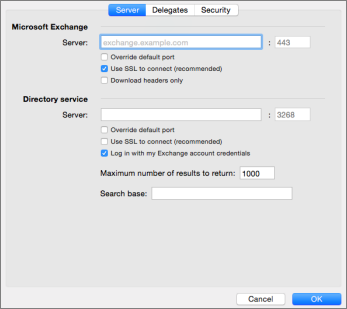 Select this check box if the directory service requires the same logon credentials as the Exchange Server. Use this box to limit the number of names returned in search results. Use this box to define the location in the directory from which the LDAP search begins.